JS: Doug, you completely dominated this years race leading from “gun to tape” besting the 2nd place finisher by over two hours – was that expected, was that the plan? DK: Did I plan to go out in the lead and hold that wire to wire? Absolutely not. My plan was to go out and run my first lap in around 2:45 and then add 15 – 20 minutes per lap after that. That would’ve gotten me a time of around 21 or 22 hours which was my goal. There was some pre-race talk of me winning, probably fueled by the secret algorithm of Ultrasignup. But I really discounted that in my mind for two reasons. First of all, I assume that ranking is based on past performances and there is some expectation that you will perform as well as or better than you have. This is great for 20 and 30 year olds. But for us older runners, the reverse is more often true. Second of all, I get great advice from my running pals who helped me keep my focus on what I can control – my race. I can’t control how others will run, who will be in the lead, or what kind of gap will be between us. I am very competitive in some regards, and part of me slips into that mindset of thinking about where they are and what I have to do to win. But, that is not good self-talk and leads me to running someone else’s race. I just ran my race and kept at it as long as I could, and that worked out to be a dominating race – after the fact. I didn’t feel like I was dominating during the race. I was just doing my thing. JS: You are known to train well and have frequently had impressive performances at FANS 24 hour race and have the ability to knock out sub 3 hour marathons – with this, your first 100 mile trail race victory, did you prepare any differently than normal? DK: My preparation has been pretty consistent over the past few years. I have been using a training plan I got from ultraladies.com. It is pretty basic and just provides a framework for how many miles I should get a week. I adapt it to my family schedule and work in speed and hill workouts. I do some core work, lunges and squats every morning and that is about it. I don’t think my training is any more unique than others. I don’t log a ton of miles, my biggest week was 59. I don’t do a lot of slow runs. This is not by design, but because I have two daughters who keep me pretty busy and so when I go out for a run I try to get as much done as I can. I recall one entry in my running journal that said “All my long runs are turning into tempo runs!” For the same reason I don’t do a lot of very long runs. In the past I have tried to work in some 30 milers, but in this training cycle I didn’t do a run longer than 26 (which was a marathon I ran in January). I did really try to get back to back longer runs in on the weekends, but they were seldom more than a 20 and 15 miler. JS:A few years back you DNFd while in the lead of this race (Zumbro 100) – when you did that, you were far in the lead and appeared to be a lock for the win, what was the difference this year, weather and course conditions? DK: The differences between my Zumbro races in 2013 and 2017 couldn’t be more extreme. First of all, in 2013 all the trails were either snow and frozen gravel (the north faces) or slush and greasy mud (the south faces). I had shoes that were falling apart and my mental game was not far behind. I knew about three people in the ultra-community and had nobody to check in with. After 4 laps I was cold, had mud in my shoes, was scared of running another loop in the dark and talked myself out of the race. Again, I didn’t care that I was in the lead. I was doing my race and my race was over. This year the course was in perfect shape. There was no snow, mud, or rain to deal with. I had invested some money in better gear (I no longer buy my shoes at Sports Authority and my headlamp did not come from Home Depot). I knew the course very well as I finished 4th in 2015 and paced friends in 2014 and 2016. But most of all, I know a lot of people out there now. I had friends at every aid station and checked in with lots of runners and pacers out on the course. I draw a lot of energy from my friends and they keep me going. JS: Referencing the movie “No Country for Old Men” you said “Zumbro IS a Country for Old Men” and I agree, any tough 100 mile course opens up opportunities for older / more experienced competitors to do well. At the age of 50 you are not only the oldest and first Grand Master to win this race overall but you now own the third fastest time ever run on the course. Have you found you have gotten better with age because of experience, training harder or a bit of both? DK: I have thought about that movie title a lot. Although I haven’t won a 100 before, I have had some good races and I do feel that Zumbro – and many 100s – is a country for old men and women. 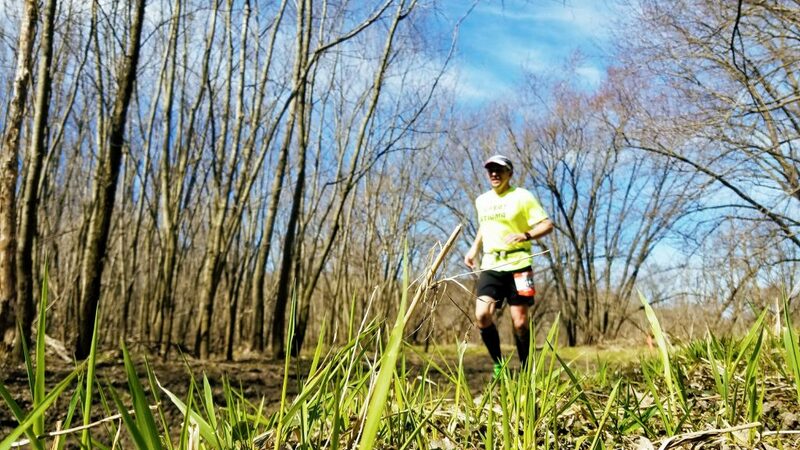 I feel so blessed to be able to be out there in the woods, cruising along, and have younger runners ask us for advice or, more importantly, treat us as equals. Occasionally when things are going really well I have joked with other grandmasters “It’s great to be able to show these kids that us old folks can still lay it down.” Of course in my head I feel as young as any of them, but the truth is I have logged a lot of miles in many different ways. That experience may cause me to lose a step or two in places, but it also gives me wisdom and resolve. I find that the trail hundred is like a microcosm of a life. You have pain and sorrow, joy and elation, changes in plans, and all the rest. Those of us who have had a few decades of the real stuff are probably better prepared when it is all thrown at us over the course of a weekend in the woods. JS: Anything of note stick out for you about this years race, any super lows or super highs to report? The video of you waxing philosophical before, during and after the race was entertaining to say the least but also provided a beautiful window into the mind of a 100 miler and the meditation and resulting unforced and profound thought that can occur during these events. DK: I really believe that a great race performance, whether it is winning or setting a PR, is not the result of one good training cycle but more of a cumulative result of several years of staying healthy and consistent work. I have been blessed with healthy joints and aside from a few little issues over the years I have not had to miss a lot of running. I do take time off, usually parts of November and December, and this year I took off three weeks to go to Vietnam with my brother during which we hiked and walked a lot but I didn’t run at all. That was just 7 weeks before Zumbro and while I was worried about missing some training time, I also knew I had a lot of hay in the barn and that rest is also a key ingredient to a healthy body. So, to answer the question, I think I am training smarter. I know more about what my body needs to get ready for these events, but my experience is probably the best tool I have right now. I am mentally strong enough to run a hundred, to listen to my body, and to keep to my plan when things don’t go as expected. I do think it’s great that younger people are moving in on this sport because they will carry on the traditions of community, volunteerism, and mutual support that are the hallmarks of Minnesota ultras. The concern of course is that they will own the podiums from here on out but there are plenty of ultras with grandmasters peppering the top ten. I would have to say that my favorite parts of this year’s race were running across the field at the end of each lap. There was a real sea of love that greeted me when I came through each time. My crew guys, Chris Swenke and Todd Rowe, were there of course, and my pacers, Jim Wilson and Brian Klug, all gave me lots of attention and kept me moving. But the volunteers and spectators were all so helpful and supportive. The video bits with Erik Lindstrom actually started up at Superior in September. Before that race started he asked me what I thought of the race and sort of as a joke I started doing these analogies: “The race is like a river…”, “The race is like a tree…”, etc. But as we are out there running for hours and our mind starts wandering it is easy to come up with more of them. Some of them were just silly musings (“This is a convoy and I am the Rubber Duck”) which I think are important. We should have a lot of fun out there. But some of them are more dialed into my core thoughts about ultrarunning. There is a real meditation that happens out there and I like to conjure images of Zumbro as a giant Buddha or Chomolungma – the Earth Sky Goddess. I find it reassuring to think of the race as a source of great power that you can tap into if needed. It is much more helpful than thinking of it as an adversary that I am trying to “Crush”. It really helps me to try to get in tune with the trail and the surroundings, to relax and let it all wash over me. This effort of getting in harmony with the trail and putting my focus there keeps me from fretting about how my legs feel and whether my stomach is getting jumpy. Of course this meditative state is constantly challenged by all the rocks and roots I have to try to not kick and trip over. I would guess that most ultrarunners have their minds take similar tangential vacations. I happened to have a videographer catching some of mine. JS: What else is on tap for you this year? DK: My race calendar is full of local things. A destination race would be fun but vacations with my wife and daughters are my priority right now. I will be running the FANS 24 hour race again in June. That will be the 6th year I have done that and while the 2 mile loop course doesn’t inspire the eastern mysticism of Zumbro, it is a non-stop ultra-festival and a great race. I look forward to volunteering at Afton in July and then Voyageur 50, Superior 100 and the Icebox 480. JS: Any other thoughts / things you would like to share? DK: Two years ago when I was getting ready for Zumbro I thought a lot about this quote from Basil King; “Be bold and mighty forces will come to your aid.” I still reflect on that quite a bit. I am very honored and humbled to have been the first grandmaster to win Zumbro. I sincerely hope that my accomplishment encourages others to reimagine what their grandmaster years can be like. We can still hang it out over the line. We can still chase down our dreams. We can still be bold. JS: Thanks Doug for all of the deep thoughts!